What if a leading dermatologist just happened to be your best friend and you could ask her anything? 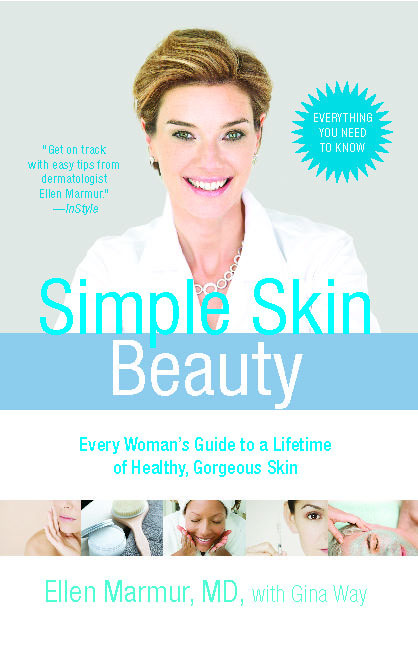 DR. ELLEN MARMUR, a world-renowned New York City dermatologist, answers all your questions with this comprehensive, cutting-edge guide to healthy, beautiful skin. As a skin cancer surgeon—and a skin cancer survivor herself—Dr. Marmur has treated thousands of patients confused about sun protection, cosmeceuticals, and antiaging procedures. She believes that you need just three basic essentials for gorgeous, healthy skin and offers refreshingly accessible solutions to issues like acne breakouts, dry skin, wrinkles, and more. • What’s the difference between sunblock and sunscreen, and which ingredients are the best? • Will drinking a lot of water make my skin look better? • What is the best facial cleanser and moisturizer for my skin? • What, besides plastic surgery, can help my sagging neck? • How do I know if this freckle is skin cancer? • Which antiaging products truly work? • What should I ask my dermatologist if I’m considering Botox, fillers, lasers, or other procedures? Filled with Dr. Marmur’s passionate expertise, Simple Skin Beauty is the definitive, go-to handbook for protecting your skin at any age. Dr. Ellen Marmur is the Chief of Dermatologic and Cosmetic Surgery and Associate Professor at The Mount Sinai Medical Center New York. A board-certified dermatologist with advanced training in cosmetic laser surgery and skin cancer surgery, Dr. Marmur earned her degree in medicine at Albert Einstein College of Medicine with distinction in research on melanoma vaccines and the national Alpha Omega Alpha award for highest excellence in medicine. Dr. Marmur is an international speaker and author with numerous publications in academic journals, books and the popular press. She is also Skin Health Editor of Merck Manual's Your Health Now magazine. She lives in New York with her husband and four children.